When it comes to fundraisers, nobody beats Rada Cutlery. Since 1948, Rada has helped tens of thousands of nonprofit groups each year. With Rada, nonprofits such as churches, schools, civic organizations, youth groups, and sports teams make the money they need. Rada offers several distinct, effective ways for groups to fundraise. Below are some video introductions to various Rada fundraising methods. Take a look and see which ones are best suited for your group! 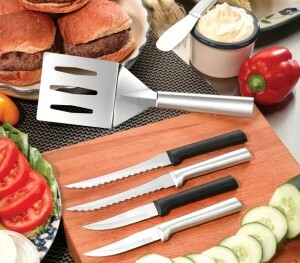 Catalog sales is Rada Cutlery’s most popular way of fundraising. It’s a tried-and-true method that allows for great versatility in the way groups approach sales. Hand the catalogs out to friends, family, neighbors, and coworkers, then watch the money roll in! Internet fundraising is an increasingly popular and effective fundraising method. It allows for groups to easily reach out to family and friends across the country to make the sales they need. Table sales are a great way to fundraise with Rada Cutlery. You not only get to interact with all kinds of potential supporters, you can offer them a wide selection of products on the spot. Since your supporters will also get to handle the products, it’s even more likely that they’ll buy, as it’s easy to recognize the superlative quality and value. Rada Cutlery’s express option makes fundraising simpler than ever. By offering prepackaged Rada products to supporters, you streamline the sales process. That way you earn good money for your group without any hassle. Door-to-door fundraising has never been easier than it is with Rada Cutlery. A friendly smile and a “H.E.L.L.O.” is all it takes! E. – Explain what you’re offering and for whom you’re fundraising. L. – Let them have a look at the catalog or products you’re carrying. O. – Take your supporter’s order! Use Rada’s easy order taker, or accept immediate payment for products you have with you. Rada Cutlery is dedicated to absolute customer satisfaction, and it shows. Countless groups and individuals have made they money they need through Rada fundraisers. Want to meet the Rada Cutlery team? Here’s a brief introduction to some of our valued customer service representatives! When it comes to fundraising, there are good ways, bad ways, and the best way. If you’re looking for the best way, you’ve found it with Rada Cutlery! Rada Cutlery has partnered with tens of thousands of nonprofit groups each year since 1948, making it one of the leading names in fundraising. By offering superior products and several effective sales methods, Rada has ensured that churches, schools, sports teams, civic organizations, charities, youth groups, and many more nonprofits have met and exceed their financial goals. 1. Unmatched Quality Products – Rada Cutlery products are renowned nationwide for their incredible quality and phenomenal value. 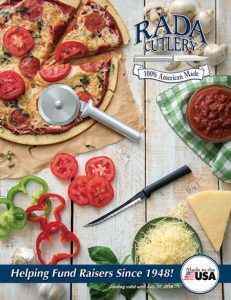 With a catalog that includes knives, kitchen utensils, dry quick mixes, and recipe books, Rada offers something for everyone. You’ll find that your group’s supporters will beg for another fundraiser just so they’ll have the chance to purchase more Rada products! 2. The Best Customer Service – Rada Cutlery is a company built on fundraising, and nowhere is that more apparent than its customer service department. Rada’s friendly, helpful customer service representatives are committed to ensuring that each and every customer is satisfied and every fundraiser is a success. The customer service department can be reached by phone, fax, email, and instant online chat. 3. 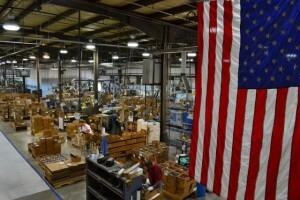 American-Made Products – Each and every item offered by Rada Cutlery is made in the USA. Your group’s supporters will be thrilled at the chance to buy American-made products. 4. Four Unique Ways to Sell – All Rada Cutlery fundraisers can utilize three effective sales options. Most popular is the catalog sales option, where a group will distribute catalogs and take orders from friends, family, coworkers, and acquaintances. Then there’s the event sales option, where your group offers Rada products at events such as sports games and church services. Next is express sales, where you offer supporters conveniently packaged Rada products. Last but not least is the online sales option, where your group utilizes the internet to allow supporters across the country to help your good cause and get some fantastic kitchen products. Use one, two, three, or all four options to take advantage of your group’s strengths and maximize profits. 5. Enormous Profits on Every Sale – Most fundraisers make profits around 10% per sale, but groups that fundraise with Rada Cutlery make an excellent 40% profit on each sale. This high profit percentage ensures that Rada-partnered groups make more money in less time. When fundraising with Rada, your group can spend more time doing good and less time worrying about finances. Request your free information packet. This will go provide further detail and supply all the information you need. Order your fundraising materials. Depending on what kind of sales methods your group is using, this could mean you are shipped catalogs, products, or both. Begin your fundraiser. 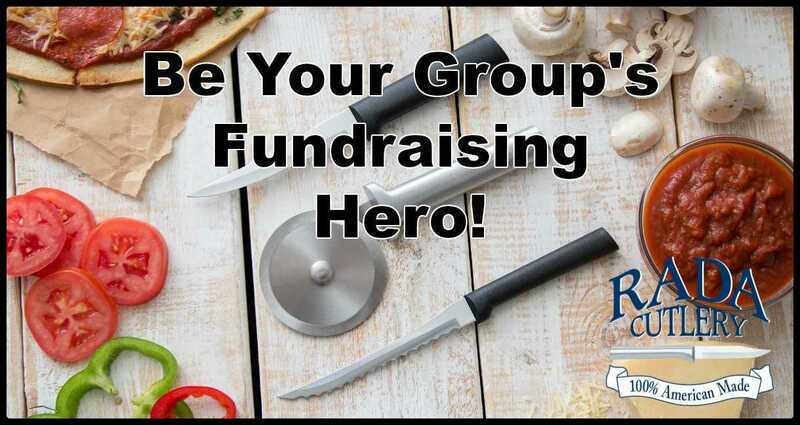 Let everyone know you’re fundraising with Rada Cutlery. Many know the Rada name and will leap at the chance to support your group’s efforts. Receive and distribute products. They’ll ship within two days, and then you can give your supporters their orders. That’s all there is to it! Get a Rada Cutlery fundraiser started today and watch the money roll. Everything in Rada Cutlery’s product catalog, from knives to utensils to stoneware, is made in the USA! From Rada’s headquarters in Waverly, Iowa, the items are made by workers committed to producing the best kitchen products you can find. Rada is honored to be part of American industry, and strives to make superlative products available at an unbeatable value. Watch this video to learn more about what makes Rada Cutlery’s American-made products so remarkable!